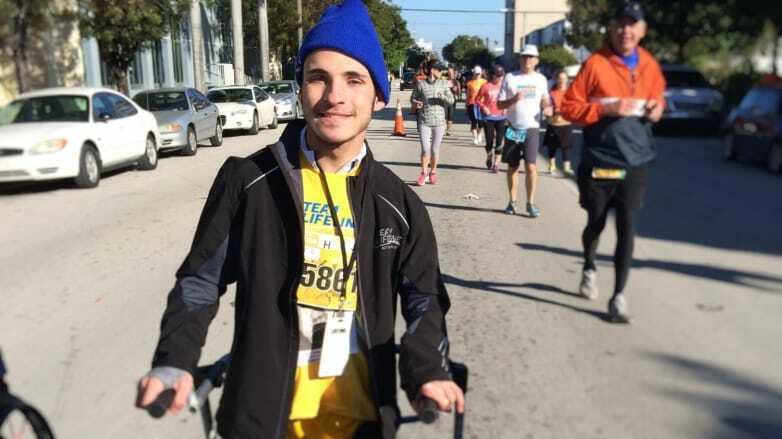 On an uncharacteristically cold and blustery day in Miami this year, Adam Wolf did something that doctors—and he himself—once thought impossible: He got up out of his wheelchair and walked. He walked for two miles—the last two miles of the Miami Half-Marathon. For the first 11.1 miles, his mom, Ali, and his friends from a New York camp had taken turns pushing him in his wheelchair. But now, with the help of a walker and the cheers of his family and friends, Adam soldiered the rest of the route on foot. The journey took nearly an hour and a half. By the end, his legs throbbed in pain. He was cold, exhausted—and exhilarated. Adam, 17, has spent a lifetime doing things no one ever thought he could do. The first thing was simply surviving. Born a quadruplet, three and a half months premature, he weighed just 2 pounds and had to be resuscitated. Soon after birth, he suffered a severe brain hemorrhage. That caused him to develop cerebral palsy, which left him without full muscle control and coordination in his legs and his left arm. Doctors told Adam’s parents that he would never stand or walk or even hold his head up. He certainly would never leave his wheelchair. Unconvinced, his family made the 50-mile drive from their Irvine home to meet orthopaedic surgeon Robert Kay, MD, at Children’s Hospital Los Angeles. After attempting to improve Adam’s mobility with physical therapy, bracing and even Botox injections, Kay, vice chief of the Children’s Orthopaedic Center, sent Adam to CHLA’s John C. Wilson, Jr. Motion and Sports Analysis Laboratory. Using special cameras and sensors, the lab produced a precise evaluation of Adam’s muscle activity and joint movements, helping Kay map out a surgical plan. In 2006, in a marathon six-hour surgery, Kay performed 12 different bone and soft-tissue procedures on Adam’s legs. For two months afterward, Adam was in casts from his hips to his toes. Then he began intense physical therapy. Six months later, at age 8, he took his first solo step. That first step was, you might say, a small step for Adam, but a giant leap for his life. More steps followed. He began, for the first time, to draw pictures of himself with legs. His world opened up. Today, he loves to swim, ski (he uses a sitting ski and even a standing “walker ski”), play board games with his family and hang out with friends. 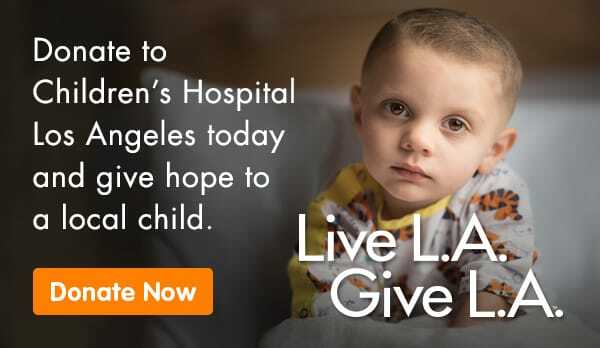 He’s also “obsessed” with watching “Grey’s Anatomy,” and this past summer, he was thrilled to meet two of the show’s stars, Ellen Pompeo and Camilla Luddington, at CHLA. 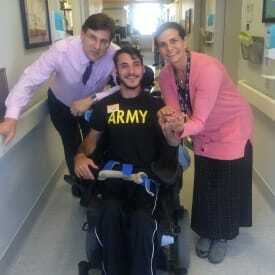 He spends most of his time in his wheelchair, but at home he can move around on foot by holding onto furniture. He does many of the routine tasks of life, like dressing and eating, independently. That feat is a result of two additional surgeries he had at CHLA. Orthopaedic surgeon Nina Lightdale-Miric, MD, transferred tendons, moved muscles and released contractures to make his left wrist, arm and hand more functional. That enabled Adam to use hand controls to drive. His right hand controls the steering wheel; his left hand controls the brakes and gas pedal. This year was the second time that Adam finished the Miami Half-Marathon on foot. In 2015, he walked the last mile of the event; prior to that, the most he’d walked was 100 steps. The high school junior is pursuing other goals, too: getting his driver’s license, going to college, and maybe one day working for the military or police department—or for CHLA. Those who know Adam have no doubt he’ll continue to reach for the stars—and get there.